How many days have you waited before that fused tubelight got changed by that ever-elusive electrician? How many times have you tried to fix that dripping faucet on your own? The waiting period could well be over for Jorhatians with the district administration coming up with a brilliant idea to make these services available at the drop of a hat or should we say at the click of a button. One just has to download Tholua, an App (yet to be uploaded on Google Play Store) to get the contact numbers of 19 electricians and 21 plumbers. 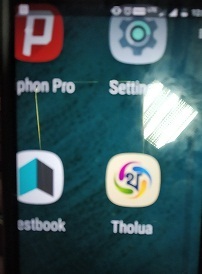 The brainchild of Jorhat Deputy Commissioner (DC) Narayan Konwar, the App named Tholua was formally launched on Tuesday by State Minister for Labour and Employment Pallab Lochan Das at the DC’s conference hall in Jorhat. Students of the Computer Science Department of Jorhat Engineering College (JEC) Debojit Bharali, Imdad Hussain Mamud, Poonam Bordoloi, Rishabh Sharma and Pallabi Bora put their heads together to come up with the said app after the District Information Officer, National Informatics Centre (NIC), Pranjal Bezbarua, approached the JEC administration. Konwar said that not only would the app have the contact details of plumbers and electricians but also of other services like drivers, welders and mechanics. By and by would be added farmers and fish farmers and then one could buy farm fresh produce and probably also get it delivered at your doorstep. He also said that a lack of plumbers and electricians was felt in the district as most of the training was given in soft skills but those so trained got jobs in Mumbai or other big cities for paltry sums and soon had to return. “We then decided to impart training in hard skills and targeted school dropouts and even a couple of graduates who were trained as electricians and in plumbing and sanitation. Out of these, a couple have been selected not to be self-employed or to work under another electrician but to generate employment after setting up an establishment,” he said. They would be developed as entrepreneurs. The trainings were imparted under the National Rural Livelihood Mission (NRLM). Das said that this was a very good initiative in keeping with Prime Minister Narendra Modi’s promise of connecting everything digitally and the initiative of Konwar could be replicated in other districts after a decision was taken by the State Government.